Yep, here is another PowerShell idiom on which I stub my metaphorical cognitive toe every time: the –confirm parameter. Let’s see if this new habit of writing about it changes my brain. I am confirming this operation, so do not prompt me for confirmation. I wish to be asked to confirm this operation, so please prompt me for it. This feels awkward and in my opinion reads poorly – something about saying “no” to a parameter named –confirm and then having the command execute silently feels wrong. I think it’s because I think of “confirming” as something I’m supposed to do, when it’s actually something PowerShell does. 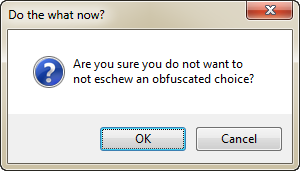 In other words, the act of confirming is PowerShell asking me whether to proceed, and not my answer to that question.